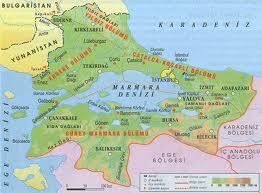 Marmara Region forms a passage between the Balkan Peninsula and Anatolia. Europe and Asia are connected to each other in this region. It covers 8.5 percent of the country with a surface area of 67,000 km2 and It gets its name from the internal sea with the same name, which is entirely surrounded by land and connected to the Black Sea and the Aegean Sea through the straits. The islands of Bozcaada and Gokceada (Imroz), situated in the open sea off the Aegean coast, are also located in the Marmara Region. The Marmara Region is surrounded by the Black Sea and Central Anatolia Regions to the east, the Aegean Region to the south and Greece and Bulgaria to the northwest. The borders of the Marmara Region are not in conformity with the provincial borders in many places just as in the other regions. Edirne, Kirklareli, Tekirdag, Istanbul, Kocaeli and Yalova Provinces are completely within the borders of the region. Some lands in Sakarya, Bilecik, Bursa, Balikesir and Canakkale Provinces are located within the borders of the Aegean or the Black Sea Regions. The people in the Marmara Region make their living in industry, trade, tourism and agriculture. It is Turkey's main industrial region and the most developed area is the Istanbul-Bursa-Izmit triangle. Istanbul, which has been an important trade center since ancient times, is located on the intercontinental transport routes and makes the region superior throughout the country. Processed food items, textiles, ready-to-wear clothing, cement, paper, petrochemical products, durable household items, ships and yachts are among the main industrial goods produced in the region. At the same time, the agriculture in the region has also diversified. Approximately half of the sown areas consists of wheat fields which is followed by sugar beet, corn and sunflower production. In the region, which realizes almost 73 percent of Turkey's sunflower and almost 30 percent of her corn production, the other important goods are vegetables and fruit. This region is in second place in corn production (after the Black Sea Region) and olive production (after the Aegean Region)among regions. Specially Gemlik olives are prefered throughout the whole country. Marmara region has also a developed viniculture, in Tekirdag, Sarkoy, Murefte, Avsa and Bozcaada that are known with grape production. The city of Kocaeli connected to Istanbul by highway is an industrial center surrounded by fruit orchards and vegetable gardens. In the city center, which was known as "Nicomedia" during the Roman Period, and its surroundings there are many historical works remaining from the Ottoman Period. The town of Hereke in the vicinity of the city is famous for its carpet weaving. The town of Gebze which is located on the northern shores of the Marmara Sea has a rich history. The grave of Hannibal, the famous Carthaginian commander is here. Adapazari is an industrial city in Sakarya Province which contains extensive plains of fertile agricultural lands. Fruits and vegetables rich in vitamins are grown on these lands, enriched with alluvium fed by the Sakarya River. The people of this region were known for their beauty in ancient times because of its fertile lands. Indeed, Sabina, the wife of the Roman Emperor Hadrian, whose beauty was legendary, grew up in this region and later went to Rome as a bride. The general view of Thrace which forms the European section of Turkey is like this. A foreigner who enters into the city of Edirne from Europe first of all beholds the Selimiye Mosque, a masterpiece of Turkish architecture. The Selimiye Mosque, in which the external and internal architecture reached their maximum aesthetic dimensions, reflects the beauty of Turkish art to Europe. The mosques, caravanserais, bazaars, bridges and other unique works of Ottoman architecture are worth seeing in Edirne, which was one of the seven largest cities in Europe in the eighteenth century and served as the capital city of the Ottoman State for approximately a century. The traditional Kirkpinar Wrestling competitions are also held every year at the beginning of summer in an area called Sarayici next to a grove in Edirne. The wrestling competitions last for one week and at the end the baspehlivan (wrestling champion) is selected. Tekirdag Province, in western Thrace, which has beautiful examples of Ottoman architecture and extensive beaches, is known for its vineyards and wine festivals. Sarkoy and Murefte to the west of Tekirdag, are important holiday towns besides being important wine making centers. Every year wine festivals are organized at Sarkoy. The Rustem Pasha Mosque and the Valuable Goods Bazaar are the most important Turkish structures in the town. The house where the Hungarian People's Salvation Hero, Prince Ferenc II Rakoczy lived has been turned into a museum in his memory. Kirklareli, which is the largest province of Turkey in Europe, is rich in history and nature. Fruit orchards are an important source of income for this province, which also has extensive forests. Igneada and Kiyikoy, on the shores of the Black Sea, are known for their fine sandy beaches. The Kirklar Sehitligi (the Monument of Forty Martyrs), which has 18 columns, was constructed in the memory of 40 light cavalrymen who became martyrs when the city was conquered, is the symbol of the city. Balikesir Province has borders with the Marmara Sea in the north and the Aegean Sea in the west. The Zaganos Pasha Mosque, the Yildirim Mosque, the Clock Tower and the Karesi Bey Tomb in the city are important historical structures. Bandirma, which is the largest settlement area of Balikesir Province on the shores of the Marmara, is the second largest port in the Marmara Sea after Istanbul. Erdek to the northwest of Bandirma is known for its beaches and the historical structures at Kyzikos. The Marmara, Avsa, and Pasalimani islands, which can be reached by sea from Erdek, attract visitors with their natural beauties, beaches and delicious wines. Kus Cenneti (Bird Paradise) National Park is located at Manyas Lake south of Bandirma. Every year approximately 3 million birds of 239 species visit the Kus Cenneti. This environment is an essential stopover point and breeding place for the birds. 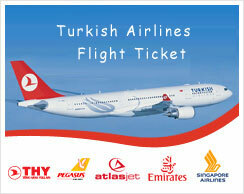 The most suitable time to visit is between 1 April and 30 May.
. The Aegean shores of Balikesir Province borders the Edremit Bay. Edremit Bay is filled with natural and historical assets and all of its shores are covered with olive trees. That's why these shores are called the "Olive Riviera". There are many old houses in the region where traditional architecture is preserved. Kaz Dagi (Goose Mountain) National Park is located to the north of Edremit. According to mythology, the first beauty contest in the world was held on this mountain, and Paris, the son of the Trojan King lived on this mountain. The French who wanted to protect and preserve aesthetic values searched world history and mythology and chose the name of Paris of Anatolia who lived on Kaz Dagi for the name of their capital city. Akcay, Altinoluk, oren and Ayvalik are favorite holiday towns in the vicinity of Edremit, famous for their natural beauties and extensive beaches. The natural shores at Ayvalik, where there are 22 large and small islands, have almost been embroidered like fine lacework. These beauties can be viewed panoramically from a location called the Seytan Sofrasi (Devil's Table). Camlik and Alibey (Cunda) Islands, besides their natural beauties, are famous for restaurants serving delicious and different seafood specialties. There are various monasteries and churches remaining from the Byzantine Period on the surrounding islands. The Sakarya River flows through the center of the lands of Bilecik Province, which is a rather important province from the point of view of Ottoman history. The foundations for the establishment of the Ottoman Empire were laid in this region. The town of Sogut is 30 km to the north of Bilecik and is famous for its ceramics and is the settlement place of the Kayi's, who were from one of the former Turkish tribes. The Turkish Ethnographical Museum constructed in the shape of a stylized Turkish tent is worth seeing.